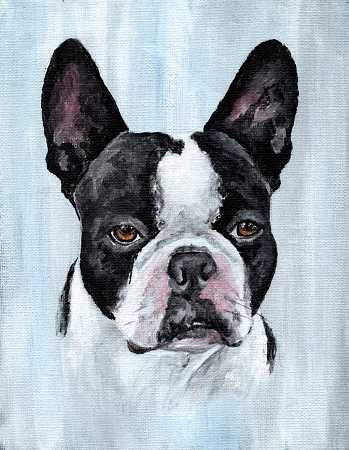 Hand painted pet portraits made from your dog photos (cats welcome too). Painted in a loose but traditional style with acrylics on either canvas panel. Canvas panel is canvas glued to a rigid cardboard surface and is ready to frame without any matting required. No deposit required, the portrait is painted first from a photo you email, then once the portrait is finished you will be able view it on the internet and decide whether you want to purchase it. Artwork is backed by a money back guarantee, if you are not happy with what you received you can return the portrait within 30 days of delivery and get your money back. From the time your pet's photo is received to delivery takes around 6 - 8 weeks. To inquire about commissioning a pet portrait please send a message through the contact page. You will be contacted within 1 work day with details on where to email your pet photo(s).